We met Creswell Oreganics in late October of 2017 through mutual friends of our former sales manager Peter. They had been hard at work building out their innovative Tier 2 facility and needed our help developing a brand and website. 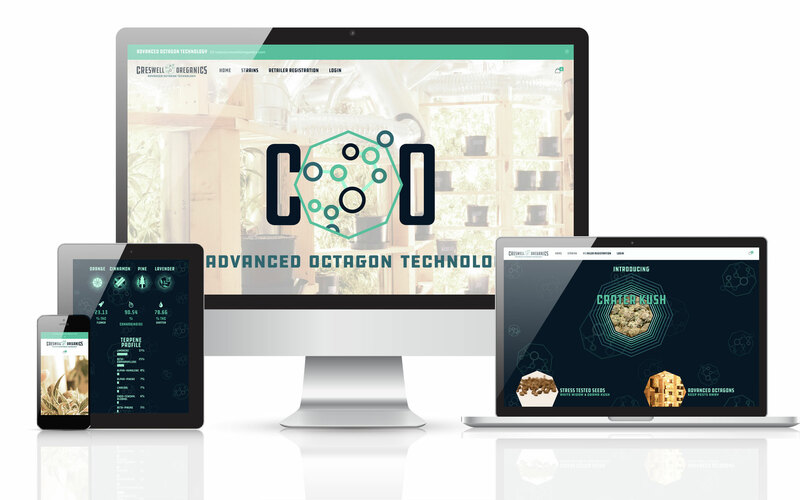 They also wanted dispensaries to be able to view, and purchase product through their website using C.O.D. as the payment method. We set out from Portland on a rainy Oregon day, driving just South of Eugene to see their operation. After meeting with Trent, Shayney, and Lindsay, touring the facility, and taking some pictures we had a good idea of the voice they wanted to convey through their branding. They were hard-working, intelligent, friendly, and cared very deeply about their product and its healing abilities. They were also using an old-school octagon growing method utilizing a proprietary air-flow technology that Trent and his father had developed. With that in mind, we set out to create a mark that was friendly, had a workin-class vibe, yet was smart and embodied their growing methods. In the middle of our branding process, we had a moment of inspiration. It fit so well, that we added it to the initial logo treatments and it was approved unanimously by the Creswell team. Once the branding was approved, we set out to build their new site. From a design perspective, we wanted to carry the vivid blues in the color palette, and the octagon theme throughout the build. We designed a short infographic explaining their process, built icons for the terpene profile of their Crater Kush, and used eye-catching dynamic bar graphs to list the lab results for their flagship strain. Using our initial content assessment from their team, we wrote some copy that told the Creswell story effectively. A large part of good content writing is the readability of the text. We pride ourselves on telling stories in a way that the end user can easily understand the who, what, and why of your company. Keeping readers engaged with content actually increases important cannabis SEO signals. Using WooCommerce, we were able to setup a private store that allows dispensaries to request approval as a wholesaler. Once the vendor is approved, they receive a unique login which allows them to view the available strains, and purchase using C.O.D.. It also allows Creswell Oreganics to manage customers, orders, inventory and approvals on the backend.